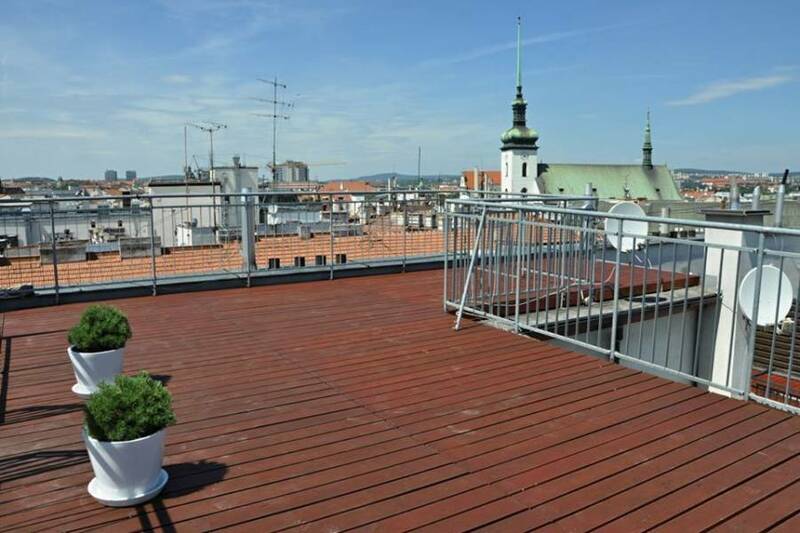 We offer accommodation in unique apartments with amazing terraces in hearth of Brno, just above the Freedom Square. 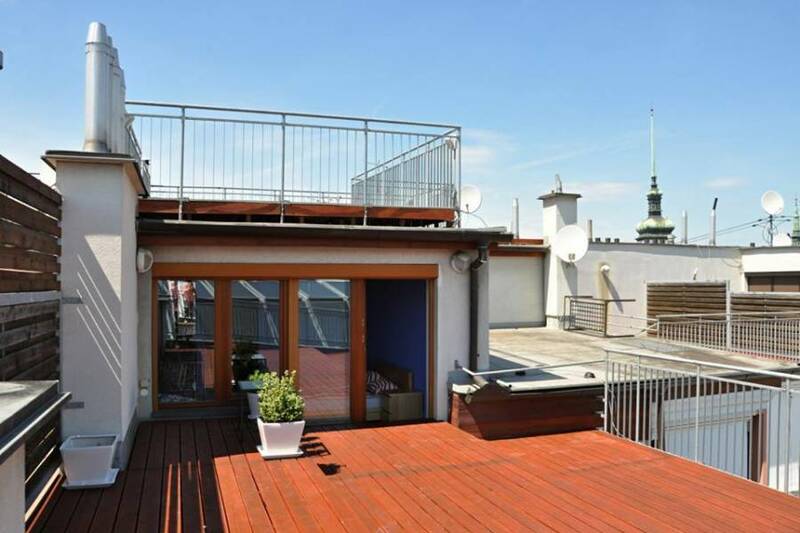 On the top of the building is a big shared terrace with marvelous view over historic downtown of Brno and its landmarks. Two of our rooms have terraces on its own. Špilberk castle is at walkable distance of 10 minutes. Main train station is 600 meters away. You couldn’t live more in center of Brno! We offer two and three bed rooms with attached private bathroom and toilet. 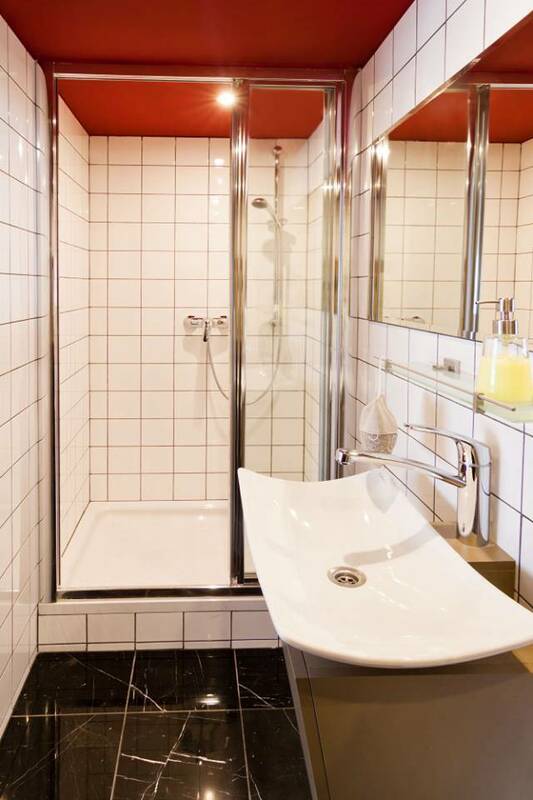 Rooms have either corner bath or shower corner in bathrooms. Guests share one big, fully equipped kitchen with stove, fridge, oven, microwave and coffeemaker. Guests have also access to spacious terrace. Three-bed room with double-bed and one separated bed and corner bath. Two-bed room with double-bed and private terrace. Two-bed room with separated beds and private terrace. One-bed room – bed is 140cm wide. Smoking in shared area and rooms prohibited. Smoking is allowed on terrace only. Apartments are accessible by elevator and stairs. We also offer document copying, printing and fax. Check-in is from 14:00 to 20:00, check-ot is between 8:00 to 11:00, if there is no other agreement with staff. 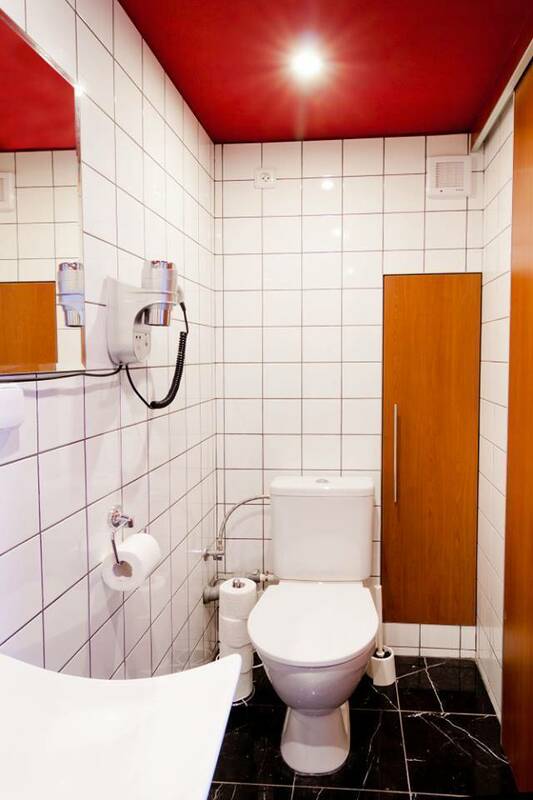 We offer two and three bed rooms with attached private bathroom and toilet. Rooms have either corner bath or shower corner in bathrooms. Guests share one big, fully equipped kitchen with stove, fridge, oven, microwave and coffeemaker. Guests have also access to spacious terrace..
Room overview: Three-bed room with double-bed and one separated bed and corner bath. Two-bed room with double-bed. 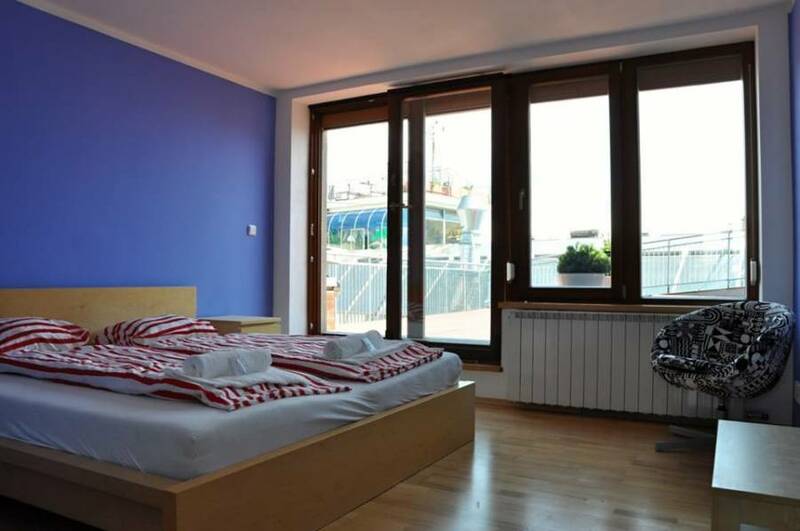 Two-bed room with double-bed and private terrace. Two-bed room with separated beds and private terrace. One-bed room – bed is 140cm wide. Smoking in shared area and rooms prohibited. Smoking is allowed on terrace only. Apartments are accessible by elevator and stairs. Other equipment Free WiFi is accessible for our guests Parking for a fee of 10euros per day at nearby parking lot We also offer document copying, printing and fax. Check-in is from 14:00 to 20:00, check-ot is between 8:00 to 11:00, if there is no other agreement with staff. Our apartments are located in the historical center of Brno, at the Freedom Square. This location is ideal for exploring the beauties of city, which are usually only a few steps away from apartments. Nearby Freedom Square is located St. James’s Church with its newly open ossuary, where you can witness unique exposure of bones, that has been discovered only recently, in 2001. The most famous sights such as Cathedral of St. Peter and Paul or just „Petrov“ located in the middle of Brno, or landmark of the city Špilberk Castle are located just outside the apartments. The Old Town Hall, which is the oldest secular building in Brno, and nearby Zelný Trh where you can find fresh vegetables and fruits every day sold by local farmers, you should not miss while exploring the town. There are plenty of opportunities also for those, who are interested in nature. Trip to Brno Reservoir is highly recommended. You can enjoy yourself while walking around this beautiful men-built lake or you can swim in it at summer time. We also recommend cruise ship, which is available from April till October. If you would like to admire the beauty of urban architecture, we recommend you to visit Villa Tugendhat. Villa is known as the most important prewar work of well-known architect Mies van der Rohe. Villa defined new trends in modern housing; it is the key work of modern architecture and in 2001 was registered at Intangible cultural heritage of UNESCO. In case you would like to visit, its advised to make reservation a month before, since there is huge amount of people interested in visit of Villa Tugendhat. Conditions for cancellation of reservatonand prepayment policies may be different for each type of apartment. More information is to be found in the reservation conditions for each room. From the Main Station: The Main Station is 600m far from the apartment. From the Main Station you can go by the No. 4 tram (in the direction of Náměstí Míru) and get off at náměstí Svobody and continue to Zámečnická street and it is the first entrance on the left. Public transportation is provided by trains, trams, trolleybuses and autobuses. Tickets can be bought at newsstands, at train stations, ticket machines or they can be acquired from the driver with additional charge. Information about transportation is provided in every vehicle.